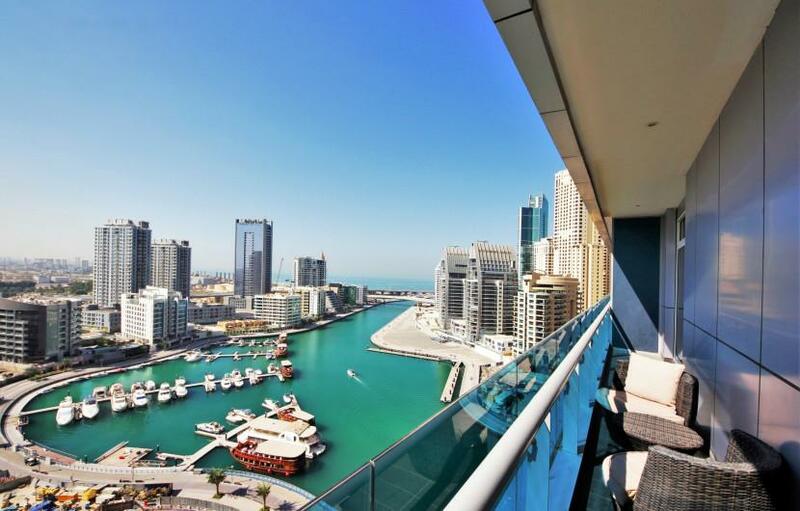 15 floors above aquamarine waters of Dubai Marina, one of the most exclusive and luxurious neighborhoods in Dubai, this stylish short term rental in Dubai is surprisingly serene and spacious. Tucked behind trendy JBR beach with a large strip of sandy beaches and entertainment for adults and kids this apartment is perfect for both the business travelers and holidaymakers. High-rise location gives you peace and tranquility, Marina views with posh yachts and traditional dhows sailing by relaxes and helps to unwind after a busy day, yet you're only minutes away from clubs, restaurants, bars and Marina Mall. The Tower is also conveniently located in the close vicinity to metro and bus stations which makes commute easy; taxis are plentiful throughout the day. Inviting and modern living area blends soft-beige furniture with floor-to-ceiling windows which perfectly catch the light and make the apartment bright and welcoming. Ready-to-live amenities include full supply of bedding, linen, and towels as well as equipped kitchen and other conveniences. It can accommodate up to three people in full comfort in its bedroom and a comfy sofa in the living room. The building offers unmatched facilities such as swimming pool sun deck, GYM, Children`s Play area, Reception area and even private Tennis Court! Get the feeling of Dubai lifestyle with the comfort of your own home!